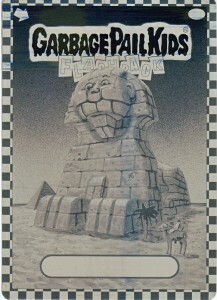 Original Printing Plates were inserted into the Garbage Pail Kids Flashback packs that were released in 2010. The printing plates are metal and come in four colors; Yellow, Black, Cyan and Magenta. Each sticker used all four printing plates during the printing process. 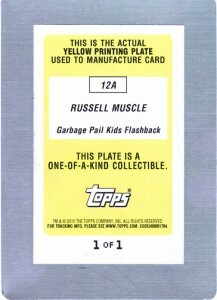 According to Topps, the plates were placed into packs at a ratio of 1:1790. There is some controversy surrounding the stated ratio however. No more than two colors of any one character’s plate has been found. 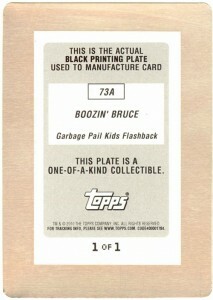 This leads some people to believe that two plates for every character are still held in the Topps Vault. Additionally, no ‘b’ plates have been found. It appears only ‘a’ plates were put into packs. It is unclear if ‘a’ & ‘b’ plates were necessary to print the cards. All the plates that have been found to date have stickers on the back with ‘a’ on them. If there are no ‘b’ plates then why put the ‘a’ on the plates? 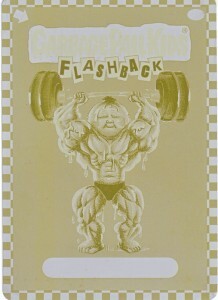 If only ‘a’ plates were used to make the GPK Flashback set, there would be a total of 320 plates (4 colors x 80 cards = 320 plates). If only two colors of every printing plate was placed into packs, then a total of 160 GPK Flashback plates were put into packs. If this is the case, the actual ratio of plates to packs would be 1:3580. There were also some errors made with the plates. The stickers on the original Bony Joanie plates were mixed up with the stickers on the Where Are They Now (WATN) Bony Joanie plates. 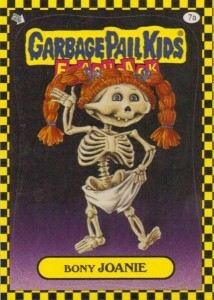 The original Bony Joanie Flashback card is 7a. The WATN Bony Joanie card is 76a. 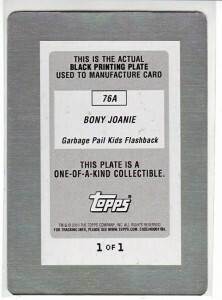 However, the stickers on the original Bony Joanie card printing plates are 76a; the stickers on the WATN Bony Joanie card printing plates are 7a. 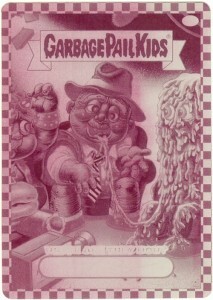 Above you see the Garbage Pail Kids Flashback 7a and 76a cards. 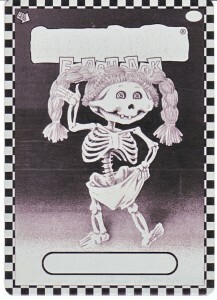 Below is the GPK Flashback Printing plate for 7a Bony Joanie but the back of the plate has the sticker for 76a Bony Joanie WATN. I believe all 7a/76a plates have the incorrect stickers on them. If anyone comes across images of other 7a or 76a printing plates please contact me so I can post them. Additionally I challenge anyone to show photographs of more than 2 colors of any one character’s plates. 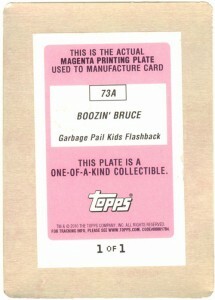 Are these GPKFB printing plates from your personal collection? I so need to get me one of these. I just got one today. 4a Cranky Franky. What can I really do with it? It has to be tough to find a buyer. Congrats on the printing plate pull. What type of pack did you pull it out of? Where did you buy it? What color plate did you get? Cyan, Yellow, Magenta or Black? The only place you will probably be able to sell it would be eBay or over at GPKUG Forum. 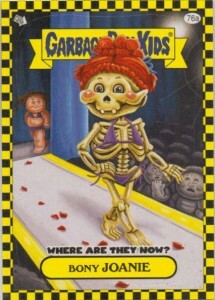 I got the GPK Flashback Series 2 Topps 2011 from Walmart. 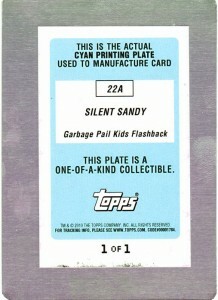 The card is the cyan printing plate of Cranky Franky 4a. I was just getting the kids a couple packs for Easter because I always loved GPK cards when I was a kid. And one of my boys brought it to me. I have no idea what these are worth. I’ve owned a great deal of plates, mainly C2.